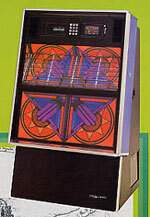 First Seeburg Juke Box, about 100 pcs prodused sold and recalled. 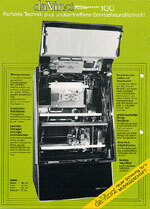 Maybea the first commercial "computer" in production. Ferrit memory bank & coded (3 wire) "wireless" connection. Available in either crome "CANDLELIGHT LODGE" or copper "COPPER KETTLE"
Fluorescent Lamps = 17watt/T8/28" 18watt/T8/24" 30watt/T8/36"
SQS160 "1st Edition Quad Sound"
Fluorescent Lamps = 15watt/T8/18" 18watt/T8/30"
Fluorescent Lamps = 15watt/T8/18" 17watt/T8/28"
Sony CD-system / 400 Watts R.M.S.